Borak, or as commonly known by the Turkish variation of the name Borek, is an umbrella term describing a huge variety of filled pastries eaten in all ex-Ottoman Empire countries. Serbia, Greece, Armenia, Turkey and The Levant have some version or another of the dish. The common feature of these pastries is a crispy flaky crust and a generous filling. Meat or cheese are by far the most common but potato, sausage, spinach or leeks can be used. Borak can be deep fried or oven baked after being brushed with oil or butter to give it some extra crispness. In Syria the two main varieties, cheese and meat, are an integral part of the mezze spread. The taste, type of pastry and filling extras varies a lot from restaurant to restaurant. Today's version is a combination of my mother's pastry recipe and my version of the meat filling. The pastry recipe is very simple and easy to work with. It is good for deep frying as it comes out nice and crispy. I haven't tried to bake it in the oven but feel free to do and let me knows how it goes. For the filling I used traditional flavouring I really enjoy but again feel free to make changes as you fancy. Like most mezze dishes there is no right or wrong, just the way you like it! Start by frying the meat in vegetable oil or Ghee butter. Season with salt, pepper and allspice. Once all the water evaporated, add the chopped nuts and the pomegranate molasses. Let the stuffing cool down while making the dough. In a mixing bowl add all the dough ingredients and start mixing with a spoon. Be careful not to burn your fingers with the boiling water. Using hot water allows all the ingredients to come together surprisingly easy. Once mixed into a dough start working it with your hands. The dough is ready to work with almost immediately. Roll the dough into a thin layer with a rolling pin. Fold and roll again. Repeat a couple of times to give the dough extra flakiness. 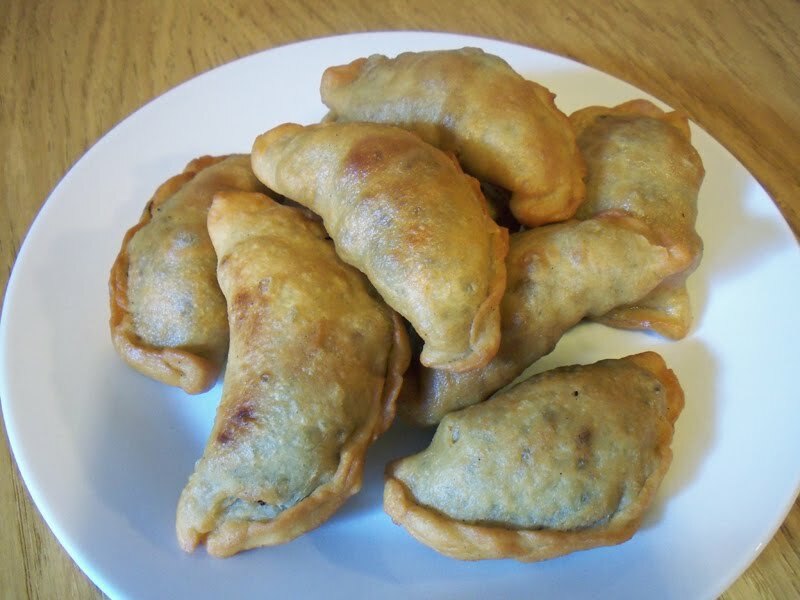 The dough is quite oily and it doesn't usually need any extra sprinkling of flour or oil. Once the dough is ready cut into circles. Spoon some of the meat mixture. Fold and seal the edge by making small firm folds. Deep fry in hot vegetable oil and dry on kitchen towel. Wonderful dish! In Lebanon we call them sambousek. My grandmother always fried them too. You are making me crave them now! Hi , just discovered ur blog and absolutely loved it. 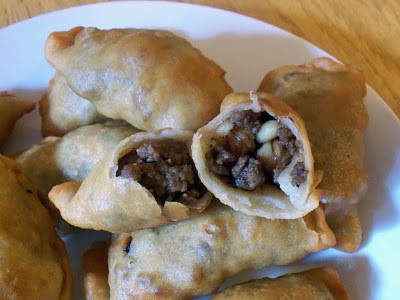 I love any arabic cuisine and love to discover arabic blogs as well...Following u! If you wish, have a peek at my Indian kitchen:)..Glad to see a England based blogger here! i never knew that making dough is that easy, i will try it in ramadan hoepfully. is it the same for pizza? Thank you for nice words. Try it and let me know how it goes. I never tried North African borek. The one I would love to try the most is the Tunisian shrimp and egg borek with the very this dough. You know the one I mean. Did you read my Sambousek post? Check it out. Different dough and some other stuffing ideas. Welcome to my blog! I am so glad you like it. I love your blog. Delicious looking recipes. This dough is very easy. You don't need to use yeast because it is deep fried. I haven't tried to bake this one but I think it will not be good in the oven. I imagine it will come out very hard. @kano you mean malsqoua dough? it's the one that is used for brik, doigts de fatma etc. if you can't find it in london, yufka should do the job as well. Thanks for the info. This exactly the dough I was thinking of. Oh, i love the idea of using pomegranate molasses in the lamb. I'm fairly new to the ingredient and still finding all sorts of fun things to do with it. these look similar to the small pies sold in cyprus too, which i love - i can't wait to try this recipe. You can really experement with this one. Change the stuffing as you like. with or without the pomegranate molasses. Add onion and/or parsley. Please try these and let me know how it goes. Oh, how I love borek. My favourite is with spinach, but I'll have to try this one soon! @kano so did you try the briks? I had one with shrimps for lunch today, very nice. Hi ,I am new in this website and I really like it ...I tried making the meat borak and it turned out amazing !!!!! Everybody love it .. I just made these and they turned out very good; loved the satisfying texture of the dough when kneading it, and it was extremely crunchy even when they went cold. I think, as you say, best to experiment with the filling - next time I'd probably make is slightly more moist and only use toasted pine nuts and no walnuts as I felt they out-stage the other ingredients. Welcome to my blog. I am delighted you are trying and enjoying some recipes.